My research has two main strands. The first focuses on the analysis of archaeological human remains, identifying diseases present in the skeletal remains and exploring the broader social, cultural and environmental context of those diseases. This work has resulted in a co-authored book, 'Life and Death in Medieval Gaelic Ireland: The Skeletons from Ballyhanna, Co. Donegal', and an edited book, 'The Science of a Lost Medieval Gaelic Graveyard: The Ballyhanna Research Project'. I have a particular interest in the archaeology of medieval and post-medieval Ireland. The second strand of research focuses on using information from human skeletal remains in new interdisciplinary collaborations. This work includes the AHRC-funded project, 'Literary Archaeology: Exploring the Lived Environment of the Slave', a collaboration between archaeological and literary scholars, working with creative writers from the writing group 'Our Stories Make Waves'. In this project contemporary writers re-imagined the lives of enslaved individuals using archaeological evidence from human skeletal remains. The research culminated in a public debate, and reading of new work at the Georgian House Bristol. Research outputs included the co-authored journal article 'Handle with Care: Literature, Archaeology, Slavery' (published in Interdisciplinary Science Reviews) and an edited collection, 'Writing Remains: New Intersections of Archaeology and Literature' (under contract with Bloomsbury). 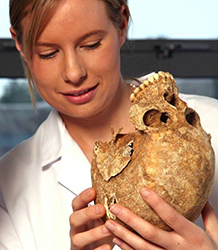 I am happy to supervise postgraduate research students working in the following areas: human osteology, palaeopathology and funerary archaeology.